Aruba's first inhabitants were the Caquetios Indians from the Arawak tribe. Fragments of the earliest known Indian settlements date back to about 1000 A.D, as do the ancient painted symbols still visible on limestone caves found at Fontein, Ayo and elsewhere. Pottery remnants can still be seen at the Museum of Archaeology. Some centuries later, the first European landed on Aruban shores. Spanish explorer Alonso de Ojeda is thought to have arrived about 1499. The Spanish promptly exported the Indians to Santo Domingo in the Dominican Republic, where they were put to work in the copper mines. With no more than three degrees difference between summer and winter averages for air temperature, and very low annual rainfall, the main factor left to affect diving in Aruba is the wind. The trade winds blow year-round, but are highest from January through April. Bad weather on the coast of Venezuela can also cause a decrease in water visibility. Newly renovated, intimate and informal, Divi Flamingo Beach Resort is your complete vacation destination. 129 guest rooms and studios; many directly on the waterfront, all with AC and a full line of bathroom amenities, and most with cable TV and telephone. Studios are equipped with kithenette. The Caymans warmest period falls between May to November. During the winter, the temperatures can drop to the low 70's. The rainy season starts in May and peaks in October. Typical Caribbean rains are short and intense. The water visibility averages around 130 ft. horizontally year round. The sister islands of Little Cayman and Cayman Brac boast even higher visibilty during the year. The water temperatures vary, from the upper 70's in the winter to the low 80's in the summer months.The Northwesterly storms occur from December through April. Cozumel enjoys a fairly constant temperature of 80°, but it rises into the 90s during July and August, which are also rainy months. During these months, it can get hot and humid if you venture away from the sea breeze or don't have an air-conditioned room. The rainy season runs from June through October (which is also hurricane season). Rainfall doesn't affect water visibility, as there is very little run-off. 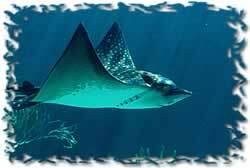 Cozumel is blessed with great visibility because of its strong currents. Cold fronts blowing down from the north can make temperatures fall during the coldest winter months, but Cozumel, because of its size and proximity to the mainland, is usually less affected than most Caribbean islands. Water temperatures vary from upper 70s to low 80s. Located on the waterfront one mile south of the downtown ferry dock, an attractive multi-level building of Spanish-Colonial architecture blends in with the waterfront. Scuba Club Cozumel has been one of our favorite places to stay in Cozumel. It's location close to town, fantastic beach diving and just the resort itself makes it one of the best operations on the Island. The white Spanish style makes it look very inviting. The rooms are designed for divers and most have views of the water. Mild temperatures vary from mid-70s in winter to lower 90s in summer. Wind is the predominant factor affecting diving. It blows much harder during winter. Also, storms in the North Atlantic bring large swells to the island's north shores, making divers move to a south lee. Hurricane season is typical Caribbean. Winter air temperatures average about 77°, with water temperatures down into the mid 70s. Summer air temperatures average 83°, with water temperatures in the mid 80s. Heavy fall and winter rains affect water visibility. Winter also blows up some heavy winds, making divers search for a lee. Hurricane season is typical Caribbean. Roatan is located in the Western Caribbean, about 35 miles off the north coast of Honduras. It is about 1,100 miles south of New Orleans. It is one of the Bay Islands. At 32 miles long and 1 to 3 miles wide, Roatan is the largest of the Bay Islands, which consist of 67 islands and cays. The terrain varies from rolling to moderately mountainous reaching 700 feet at the highest point. The ridge, which runs down the spine of the island, is formed where the peaks of the Bonacca Ridge extend above sea level. Much of the island’s paved highway runs along the top of this ridge providing spectacular vistas to the north and south. Roatan sits on the world’s second largest coral reef system. The reef parallels the coast of Honduras and then bends north and extends past Belize to the Mexican Yucatan Peninsula. Roatan is surrounded by living reef, making it a paradise for divers and snorkelers. Along the south coast, some large channels through the reef allow access to deep harbours at Coxen Hole and French Harbour, as well as safe anchorages at Port Royal and Oak Ridge. Roatan is the transportation hub of the Bay Islands, boasting an international airport as well as passenger ferry service between Coxen Hole and the mainland city of La Ceiba, and the islands of Utila and Guanaja. During the coldest winter months, north winds can blow down and disrupt the diving. The rainy season starts in October or November and runs into February, but it doesn't usually affect visibility that much. The no-see-ums are usually the worst during wet weather. The hottest months are March and August.